It’s a key date in the West Yorkshire agricultural diary and this year’s Todmorden Show will feature a new livestock category. For the first time in the show’s 85-year history, the sheep section will be enhanced by the addition of a primitive breeds class. Margaret Wood, the show’s sheep secretary, said: “The sheep section at Todmorden is for the first time this year running a new section promoting primitive breeds as laid down by the Rare Breeds Survival Trust, specifically Boreray, Castlemilk Moorit, Hebridean, Manx Loaghtan, Ronaldsay, Shetland and Soay. The section is supported by local rare breed smallholder Rob Furness and it will be judged on show day - Saturday, June 20 - by Linda Barnard of Malton. Mr Furness, 58, who is retired, runs livestock on his land as a hobby including rare breed geese and hens, and 18 Castlemilk Moorit sheep. A small hardy breed prized for their fleece, the Castlemilk Moorit sheep was bred by Sir Jock Buchanan-Jardine on his Castlemilk estate in Dumfriesshire in the early 20th century using Manx Loaghtan, Moorit Shetland and Wild Mouflon. Mr Furness entered some of his sheep in a different class at Todmorden Show last year and in the primitive sheep section of Trawden Show - where he won best newcomer. 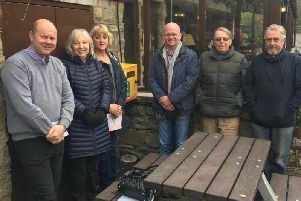 Encouraged by the response, he has worked with Todmorden Show organisers ahead of this year’s event and is urging others to get involved in this year’s new competitive class. “We ventured to the shows mainly for a day out to promote the breed,” Mr Furness said. “I have to say that we had so much interest it was surprising that people had not seen sheep of that colour and with horns. “For those who go to the shows and keep sheep they will know that there are many various rare breed and primitive sheep, however the general public are unaware. Todmorden Show is held at Centre Vale Park and regularly attracts 10,000 visitors. For entry forms visit www.todshow.org.uk. The closing date for entries is June 13.